The Danish Institute of Fire & Security (DBI), based in Copenhagen, successfully applied to the EU for funding to send 20 security trainers across to the UK in a partnership with Skills for Security, the Skills and Standards Setting Body and Issuing Authority for Apprenticeships within the Security Sector. The project aims to see how security training is implemented here in the UK and share best practices. Hundreds of locks on cell doors at a US prison opened simultaneously over the weekend - but no one escaped. About 500 locks popped open inside the Montgomery County jail, prompting officials to declare a security emergency that included posting about 20 police cars on the perimeter of the facility. AMG Systems, the British manufacturer of sophisticated Megapixel cameras and CCTV transmission technology, launched their new 'mini' TotemCam360 at the main US security technology show - ISC West - in Las Vegas, USA. Top U.S. security officials face a grilling from lawmakers on Tuesday over whether authorities who have charged one man with the Boston Marathon bombings may have overlooked warning signs two years ago flagging the other suspect. Dzhokhar Tsarnaev, 19, was formally charged with using a weapon of mass destruction and malicious destruction of property resulting in death at a bedside hearing on Monday in his hospital room, where he was recovering from gunshot wounds suffered in shootouts with police. The US House of Representatives has passed legislation designed to help companies and the government share information on cyber threats, though concerns linger about the amount of protection the bill offers for private information. This is the second go-around for the Cyber Intelligence Sharing and Protection Act after it passed the House last year but stalled in the Senate after President Barack Obama threatened to veto it over privacy concerns. 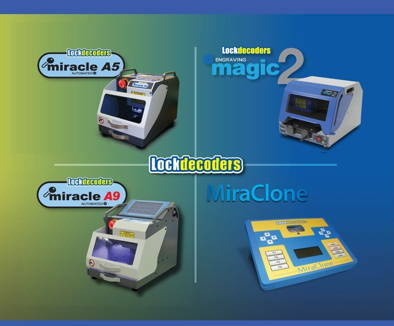 Lockdecoders USA is proud to announce that we will be at Just Cars being held in Las Vegas May 3-4, 2013 at the Las Vegas Speedway, Las Vegas, Nevada, USA. While IFSEC is on this week we have selected a small handful of exhibitors to preview. Next year the show changes venue to London and while it is already the world's biggest show of its kind, I think we can really expect to see a spike in visitor numbers then. Herta Security launches BioSurveillance NEXT, said to be the World’s fastest facial recognition solution for video surveillance. 40X faster than conventional CPU based facial recognition, BioSurveillance NEXT processes in real time, live/recorded HD video at 150 fps using GPU technology. Designed for facial identification in crowds. SMP Community range of Cash & Jewellery Safes in 6 grades. SMP are the only UK manufactured to test to 6 grades in a range of sizes to suit all requirements inc deposit models. Test certificates are to BSEN 14450, 1143 & 1183 and are ratified throughout Europe. Protection for staff and stock from forced entry at vulnerable moments, like closing time. Lockpoint's Wyvern encrypted wireless access control system can be activated by key fob or panic button at the first sign of danger. No electrical wiring. Easy-fit and suitable for most inwardly opening doors. Visit us on stand 4/F162. Van users have been reminded by The Fuelcard People of ever-tighter emissions controls. Steve Clarke, group marketing manager, said: "Life is already tough for anyone running vans or other LCVs, but those who fail to address emissions reduction will find it getting harder. As restrictions spread, the worst polluters will soon find themselves running out of road. Yale has unveiled its latest pioneering Doormaster multipoint lock products following the range's successful launch in 2012. 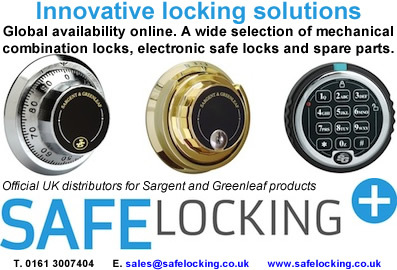 Development and improvement of the range has been made to ensure greater usability for locksmiths. Powerful and uncomplicated video management software will be available for free trial download - extended to readers of Locks and Security News. Milestone Systems' open platform IP video management software (VMS) is installed in the Norwegian ship service called 'Hurtigruten' with network cameras from Axis Communications. An engine room fire in 2011 prompted renovations with innovative surveillance technology for safety and operational excellence. UBM Live - organiser of IFSEC International and FIREX International, the world's leading annual security and fire events - has announced the shortlist for the IFSEC & FIREX Industry Awards 2013. Genuine Lishi have released the new auto-locksmiths 'bible' in the form of The Complete Genuine Lishi User Guide and Training Manual Kit. The crime deterrent power of SmartWater forensic marking is to be made openly available to the commercial vehicle sector for the first time, it has been revealed. A new High Temperature Marker developed by global risk management specialists, SmartWater Technology Ltd, will tackle head-on the growing problem of catalytic converter theft that blights fleets and private motorists alike. The British company's latest innovation was officially unveiled at the Commercial Vehicle Show, held at Birmingham's NEC (April 9-11). IronmongeryDirect, the UK's largest online and mail order supplier of ironmongery products to the trade, has locked down prices on thousands of products in its brand new catalogue (issue 88). And with an extended cut off time, customers can take advantage of these fantastic deals by ordering up to as late as 8pm for free next day delivery. Two men have told how they cheated death at a railway level crossing when the gates closed in on their van without warning as a train approached. Steve Bulleyment corand Simon Bates were just 20ft away as the barriers in Metheringham, Lincolnshire, started to shut. Leading control room furniture manufacturer Winsted today announces that it has won the Queens Award for Enterprise in the International Trade category. This prestigious accolade marks the second consecutive year Winsted has been recognised in the Queen's Awards for Enterprise, having won its first in 2012. Bike thefts have been slashed at Newcastle University simply by putting pictures of staring eyes above cycle racks. The two-year experiment was carried out by a security manager at the campus who had seen similar studies suggest that people behave better when they feel they are being watched. Academics found that bike racks which had eyes placed above them experienced 62 per cent fewer thefts than the previous year, while those without eyes saw thefts increase by 63 per cent.